Five explorers have disappeared while searching for evidence of Ancient Astronauts! Join the Unsolved Mystery Club in the hunt for the missing explorers and unlock ancient secrets of the past. 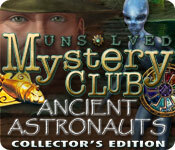 Explore exotic locations around the world and uncover artifacts supporting the existence of visitors from other worlds in Unsolved Mystery Club: Ancient Astronauts! Unsolved Mystery Club®: Ancient Astronauts® Collector's Edition is rated 3.6 out of 5 by 11. Rated 5 out of 5 by coha92 from Play the Standard Version Unsolved Mystery Club ®: Ancient Astronauts ® is a very entertaining game. I started the Collector's Edition but it didn't work and BFG gave me a refund. I also own the Standard version of the game and it WORK PERFECTLY!!! I really wanted to finish the game that I started because it was different from many of the games I played so far. Beautiful graphics, music, etc. Rated 4 out of 5 by rosekaufmann from REPLAYABLE GAME About 5 hours. STORYLINE: Investigate 5 explorers who have disappeared while researching ancient astronauts in different locations. The explorers and the places where they vanished are investigated one at a time. You have to find pieces of a black sun gem during your investigation. Game is linear. GOOD: - Visit gorgeous locations in Mali, Giza, Maya, Peru and Antartica. - Adventures in Mali and Peru were fairly easy; Egypt was the most challenging to me. - When it appears there is nothing to do at a location, you have to look for things to do. They are there. You will know when you are finished with one location. - HOS were bright and detailed, not too crowded, with some interaction. - Check your interactive journal before going to the next chapter. Any uncollected items will be indicated by a lock. - Plays widescreen. - Replayable; HOS are random. - Bonus chapter is an additional rescue. NOT SO GOOD: - Conversations were too fast; no way to slow them down or repeat them. - You could suffer from vertigo at the beginning. Rated 4 out of 5 by shorenuf from One big step for game play, one giant leap for story telling… An excellent game within a uniquely told Adventure. You are off in search of 5 missing scientists… The Story: Were there extraterrestrial beings on earth thousands of years ago? This game's story mixes scientific evidence with possible proof and conjecture in five different places around the globe. The core story is complete. 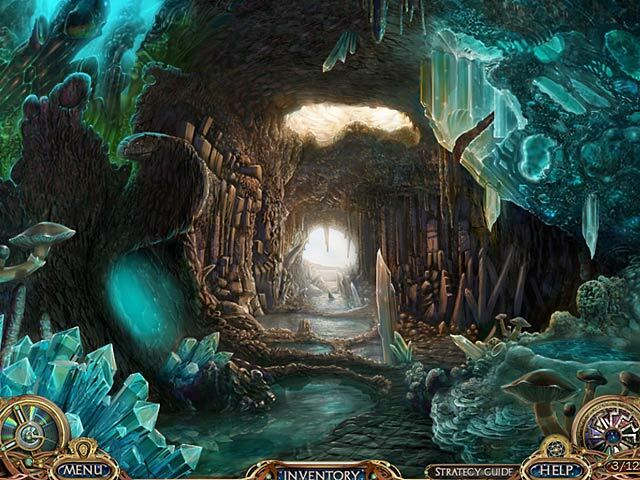 The setting: The music, stunning artwork, and atmosphere change appropriately for each location. A lot of attention went into the realistic details in each place. You will meet some interesting characters along the way. 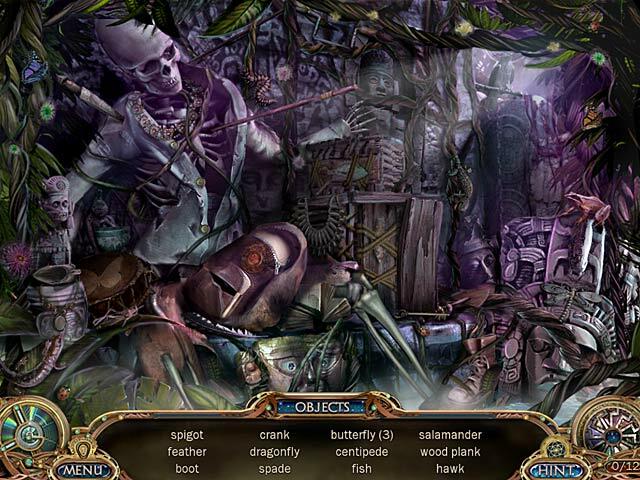 The Game Play: • The game has a Widescreen option and voice overs. • Two play modes -- casual and advanced (slower refresh time for hints and puzzle skips). • H0G scenes have an interactive component. They are junk pile and require a good eye. • Mini games -- Some simple, some challenging, some unique -- a good mix. • Adventuring -- each location is self contained but there is lots to accomplish within each one. • Inventory items -- be prepared to move your cursor everywhere, explore everything. • Diary -- not exactly; important data is saved in a communications device, different and well implemented. • Built in help system -- For H0G scenes you are shown a hidden item. For tasks, the help system offers a multiple choice of "what do you want to know" options. Nice. Collector's Edition content: • The Strategy Guide is adequate but not great. Accessible from the game, but some puzzles which would benefit from video solutions only show the final solution screen shot. • Concept Art and character drawings. • 5 Soundtracks than cannot be saved. * Bonus Chapter -- It was as well done as the core game. Basically, a separate story. But it was rather short. One challenging type of puzzle repeated 3 times, others were pretty simple. Several H0G scenes. If you liked the game play n the core game, there's nothing to dislike about the bonus chapter. Overall, I thought this game was as good or better than many. I liked the inclusion of real history and would like to see more games structured this way. Rated 4 out of 5 by centauri272 from Interesting game Interesting story. Good graphics. The sound is a bit boring so I turned it off. HOS clear. Mini-games challenging. The HELP system is good, because it can be quite difficult to know what to do next. The SG is also good and helpful. The game is not very long but you spent a good time playing. The bonus game is quite short so the SE would also be ok. Rated 4 out of 5 by bette76502 from A little confusing There is no way this game could be played without the stratagy guide. the 1st time I played Iwas all over the place. So, I played it again and had to use the SG in every scene. But it has a good enough plot,and is interesting enough to keep playing on. Rated 3 out of 5 by dptrainman from Problem with Objects I can't use this bat like thing on the wall or the chest piece on the idol, so I would like a refund, please ? 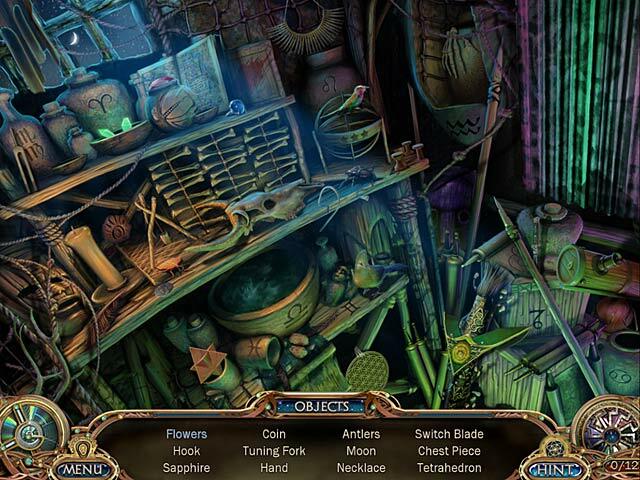 Rated 3 out of 5 by wolfbane1946 from unsolved mystery club ancient astronauts I found this game quite interesting until I got to where you have to use the bludgeon on the purple eyed head. It kept telling me that "it won't work here". No matter what I tried I could not get any further with the game. Help please! Rated 3 out of 5 by BlueOctober from Just Ok I think the storyline could have been really good, but they relied on reading cards over actual story telling. The HO scenes were good...not too many, which I prefer. The graphics were just ok to me. It seems to just end. There wasn't a whole lot of build up or anticipation. Overall, it was a decent way to kill time, but I probably won't play it again. Five explorers have disappeared while searching for evidence of Ancient Astronauts! Find the explorers and solve the mystery!